S Andhavarapu, B Low, J Raj, S Skinner, J Armenta-Corona. 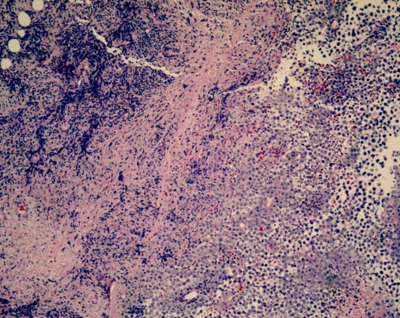 Regressed Testicular Seminoma with Extensive Metastases. The Internet Journal of Oncology. 2007 Volume 5 Number 1. Testicular cancer is the most common solid malignancy affecting males between the ages of 15 and 35, although it accounts for only 1 percent of all cancers in men. In patients presenting with manifestations of extragonadal germ cell tumor or lymphoma, it is important to rule out a primary tumor in the testes, even when they do not present with symptoms such as testicular pain or mass. Here we describe a case of burned out tumor of testis with extensive metastases in a patient who had no testicular symptoms and discuss the importance of imaging and further management. A 36-year-old male presented with swelling on neck, shortness of breath, dysphagia, hemoptysis, night sweats and fever of three weeks duration; he did not report any weight loss. There was no significant past medical history. Pertinent physical findings included cervical and supraclavicular lymphadenopathy. At presentation, he had a white cell count of 10,500 cells/mm 3 , hemoglobin of 13 gm/dl and platelets of 512,000 cells/mm 3 . 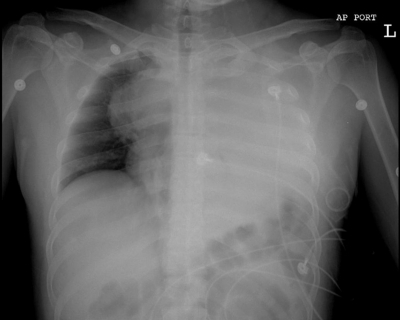 His chest X-ray showed widening of the mediastinum suggestive of an underlying mass (Fig1). 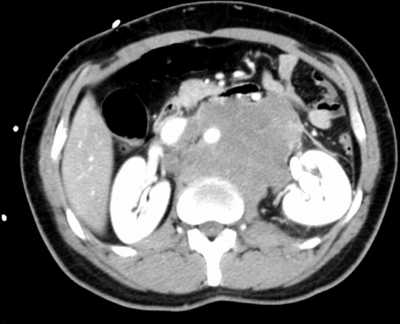 CT scan of chest and abdomen revealed massive mediastinal adenopathy (Fig 2) extending into the thoracic inlet bilaterally, multiple supraclavicular and left hilar adenopathy with pleural effusion, and extensive retroperitoneal adenopathy (Fig 3) encasing the aorta, inferior vena cava and peripancreatic region. All the visceral organs were grossly normal. Considering the patient's symptomatology and imaging, the differential diagnosis included lymphoma, thymic carcinoma and extragonadal germ cell tumor. The germ cell tumor markers beta human chorionic gonadotropin (HCG) and alpha feto protein were later tested which were 12 MIU/ml and 2.0 ng/ml respectively. His LDH was elevated at 6233 IU/L. Subsequently supraclavicular lymph node biopsy (Fig 4) was done, which showed diffuse effacement of lymph node architecture with proliferation extending beyond the lymph node capsule. Tumor cells showed a characteristic sheet-like arrangement with polygonal nuclei having prominent nucleoli. 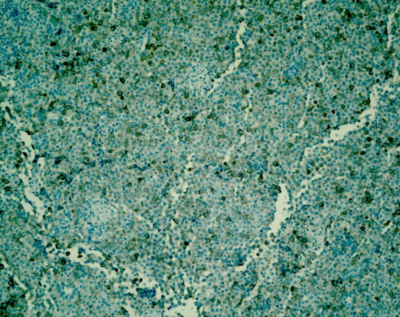 Immunoperoxidase stains showed that cells were positive for placental-like alkaline phosphatase (PLAP) and negative for lectin-reactive alpha-fetoprotein (LCA), B-cell, T cell markers, S100 and HCG consistent with seminoma (Fig 5). 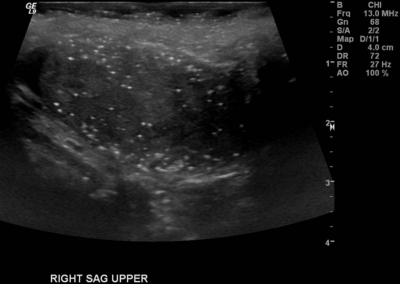 Scrotal ultrasound was done to determine if testis was the primary source of the tumor; it showed bilateral microlithiasis, decreased blood flow to the right testicle and extreme heterogeneity but no definite mass (Fig 6). Because of the indeterminate findings on sonography, the patient underwent right radical orchiectomy. 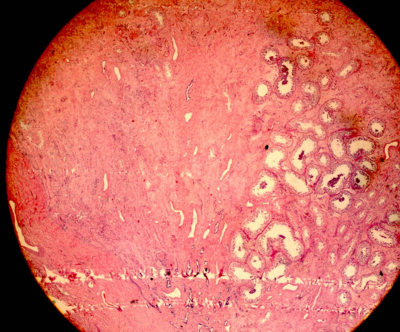 Histological examination of testis showed nodular scarring and fibrosis, lymphoplasmacytic infiltrate and testicular atrophy with microlithiasis and calcification (Fig7,8). 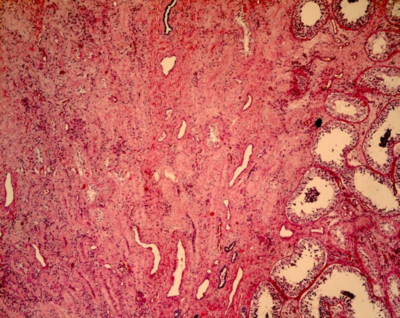 Findings were supportive of regressed germ cell tumor. Post surgery, he developed respiratory distress and airway compression due to the thoracic mass and was intubated. 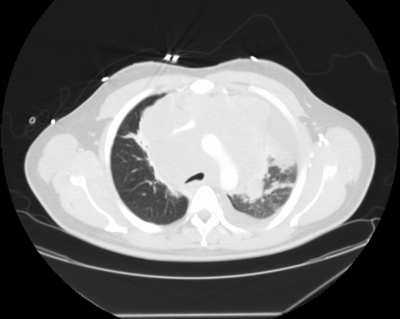 Repeat CT chest showed complete obstruction of the left pulmonary artery secondary to the mediastinal mass and worsened pleural and pericardial effusions. Chemotherapy with bleomycin, etoposide and cisplatin was started but had to be discontinued secondary to development of acute tubular necrosis and renal failure. The patient finally expired after the family decided to withdraw care. Azzopardi and Hoffbrand reported the first case of retrogression in testicular seminoma with viable metastases and described testicular scar formation in six patients with metastatic testicular seminoma. 6 Compared to nonseminomatous germ cell tumors (NSGCT), pure seminomas are more likely to be localized at presentation. Approximately 80 percent of men with seminomas present with stage I disease (limited to the testicle) while 15 percent have stage II disease (limited to retroperitoneal nodes). 7 Rarely seminoma spreads via the bloodstream to other areas (e.g. liver, lung, bones, or brain) that are more commonly involved by NSGCT. Fewer than five percent of patients have spread beyond the retroperitoneal nodes at presentation. Testicular seminomas are grouped into good and intermediate prognosis based on the prognostic model by the International Germ Cell Cancer Collaborative Group (IGCCCG). Only nonseminomatous germ cell tumors have been described under the poor prognosis category in the prognostic model. Microscopically, most of the regressed tumors showed extensive scarring, testicular atrophy, shrunken seminiferous tubules with decreased or absent spermatogenesis and lymphoplasmacytic infiltrate or intratubular germ cell neoplasia. 8 This patient had no testicular symptoms but had all the above microscopic findings, in addition to extensive metastases and poor prognosis. To our knowledge, this is unique in comparison to the earlier reported cases. In summary, in patients presenting with manifestations of extragonadal germ cell tumor or lymphoma, it is important to rule out a primary tumor in the testes, even when they do not present with symptoms such as testicular pain or mass. Ultrasound of testes can be done as the initial diagnostic imaging to rule out a primary tumor. If it shows nonspecific findings of inhomogeneity or microlithiasis without any obvious mass, it should raise suspicion for regressed tumor and further investigations should be done. 2 Testis is a privileged site with respect to its ability to harbor viable tumor cells despite adequate systemic combination chemotherapy. Orchiectomy should be considered as the next therapeutic modality as it improves the overall outcome in a primary testicular tumor. In our opinion, if the biopsy shows scarring, atrophy of seminiferous tubules, fibrosis or lymphoplasmacytic infiltrate, the patient should be diagnosed as having testicular seminoma and treated likewise. We sincerely thank Ms. Rebecca Birr (Director, Health Sciences Library, Maricopa Integrated Health System) for her help in preparing this manuscript. 1. Holmes AS, Klimberg IW, Stonesifer KJ, et al: Spontaneous regression of testicular seminoma: case report. J Urol 135:795-6, 1986. 2. Kebapci M, Can C, Isiksoy S, et al: Burned-out tumor of the testis presenting as supraclavicular lymphadenopathy. Eur Radiol 12:371-3, 2002. 3. Sarid DL, Ron IG, Avinoach I, et al: Spontaneous regression of retroperitoneal metastases from a primary pure anaplastic seminoma: a case report. Am J Clin Oncol 25:380-2, 2002. 4. Fabre E, Jira H, Izard V, et al: 'Burned-out' primary testicular cancer. BJU Int 94:74-8, 2004. 5. Bohle A, Studer UE, Sonntag RW, et al: Primary or secondary extragonadal germ cell tumors? J Urol 135:939-43, 1986. 6. Azzopardi JG and Hoffbrand AV: Retrogression in testicular seminoma with viable metastases. J Clin Pathol 18:135-41, 1965. 7. Donohue, JP, Zachary, JM; Maynard, BR: Distribution of nodal metastases in nonseminomatous testis cancer. J Urol 128:315, 1982. 8. Balzer BL and Ulbright TM: Spontaneous regression of testicular germ cell tumors: an analysis of 42 cases. Am J Surg Pathol 30:858-65, 2006.